At first glance, the Trek 2.0 looks like a relatively simple dry herb vaporizer with a ceramic dish, glass vapor collector and glass mouthpiece. 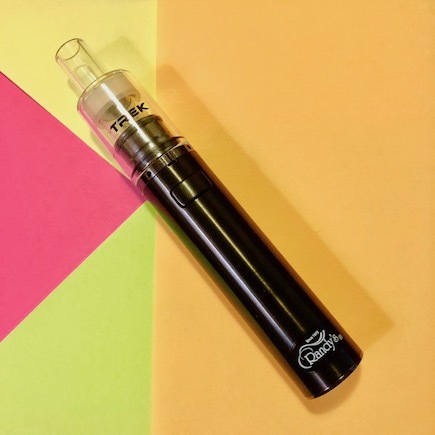 However, the Trek 2.0 can also reach temperatures beyond the combustion point of dried and cured herbs giving this seemingly simple vaporizer another personality. As a dry herb vaporizer, the Trek 2.0 heats quickly to 385º F and holds for 4 seconds. Pressing the operation for longer than 4 seconds results in an increasing temperature of up to 750º F with a maximum session length of 10 seconds. The 385º is good for a nice relaxing vape session and a flavorful experience where the higher temperatures provide the same feel as normal combustion. The Trek 2.0 starts with a long life battery with 510 connection and is topped off with a ceramic dish inside a glass vapor collector mouthpiece and a stainless steel screen to protect agains errant hot embers. The Trek 2.0 and both of it’s personalities are available in three colors and at a good value price from Randy’s Wired Papers. A brand that has been trusted for over 40 years.